We don't often send out messages aside from our trade notifications but we'd like to draw your attention to a couple of recent posts and one other item. First, please take a look at our Tuesday post. It contained a set of Pressure Release Valves for the E&P group to continue and expand upon the current bottoming action due to oil prices. Second, please see today's post (the Friday Morning post) which runs through comments on why rig counts do matter and the coming slow down and reversal of U.S. oil volume growth. The other item to note is that we often put helpful information under the ZLT Stats category which can be accessed via the pull down menu at upper left on the site. Here you can find recent posts containing information grids covering capex, EBITDA, production growth rates, and other items and posts covering ZLT and name of interest hedge positions. These are reference pieces meant to be viewed with the company specific pieces and play specific pieces close at hand. Short interest in our group is at epic levels and we see this as likely to be disappointing for many betting against the US onshore E&P complex. Capital and operating costs are coming down and balance sheets are being shored up. Rumors of the group's demise have been greatly exaggerated. Thanks much for subscribing and don't be a stranger on the site (ask questions when you have them). Rig Count Watch: From the Thursday post with rigs updated for Friday's new number. Contrary to talking head commentary this isn't just vertical rigs coming out of play. 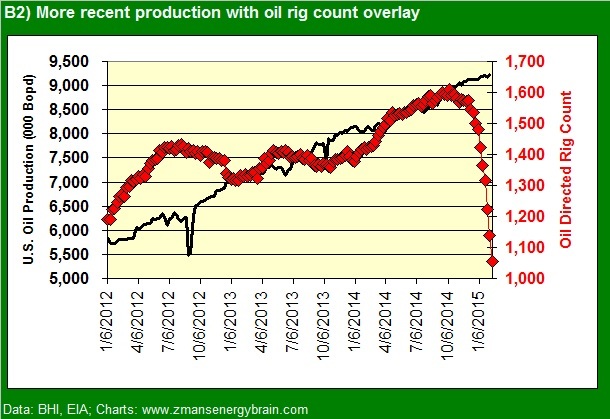 The U.S. lower 48 horizontal count is now off 347 rigs or 25% from it's peak in late November 2014. Verticals are off 44% but are the smaller piece of the drop at down 168 rigs. Want to know more about Zman's Energy Brain? Check out How To ZEB here. This entry was posted on Sunday, February 15th, 2015 at 11:44 am	and is filed under Uncategorized. You can follow any responses to this entry through the RSS 2.0 feed. You can leave a response, or trackback from your own site. 98 bottles of beer on the wall (i mean rigs)…..they keep falling hard. last 3 weeks alone close to 300 rigs out of service? Sorry to be clueless, but when you said this on the Friday post, did you mean to imply that th consumer will no longer be enjoying $2 gasoline as oil prices will be notably higher? Wyoming in answering some questions about rigs and frac spreads for us added that 2016 is going to be a big wake up call for the consumer and we completely agree. re 2 – yes, exactly. US production flattens out. The world adds 1+ mm bopd of demand in 2015 and again in 2016.
re 3, so does that mean, if all went according to plan / model (does that ever happen? :). not in my line of work), that we'd expect a rather large ramp in rigs in 2016 to rush back in and grow production to take advantage of the higher prices and if so, how quickly can rigs come back online and we get to do it all over again? the faster they fall, the faster we get back on track as it would mean mission accomplished for OPEC. if it sounds like laughter, then its only masking the tears. Last week's weather: Natural Gas Population Weighted Heating Degree Days came in at 197 vs 205 normal and 221 in the preceding which helped generate last week's 160 Bcf sub par withdrawal. This week's forecast: HDDs are forecast to balloon to 260 vs 193 normal for this week of the year. re 4 – they should be pretty gradual in the way they come back. E&Ps are going to need to believe in the oil price as being stable before adding back a big swell of rigs. Even the stronger balance sheet names are talking late 2015 to early 2016 as the earliest they see adding a rig or two back. Barrons interview with 4 decent folks (FIDO, etc) managed to say little new imo. Most would wisely not take a guess on oil prices (one guessed into the $30s); $60-70 again suggested to be where rigs go back to work. re 8 – $60 to $70 is not it for the bulk of rigs, at least not in appreciable size and not for some time (if it went over $60 and stayed there for several months then 1H16 some come back. My comments come from talking to some managements, listening to recent call language, but also from speaking with people who manage rig and frac crews at the company man level and have to do the firing, not guessing, at least not on the bulk of the rigs. The number where you see them come back, after some stability is likely higher, at least $75 I'm told. "The train consisted of two locomotives and 109 rail cars and was travelling from North Dakota to Yorktown, Virginia." Appears that you are getting an ice storm in Little Rock, Z; sympathies to the people who have to commute in that stuff.